Dera Ghazi Khan international Airport or D. G. Khan int. 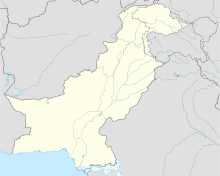 Airport (IATA: DEA, ICAO: OPDG) (Saraiki, Urdu: ڈیرہ غازی خان بین الاقوامی ہوائی اڈا‎) is 15 km (9.3 mi) from the city centre of Dera Ghazi Khan, Punjab, Pakistan. It caters mainly to the population of Dera Ghazi Khan. The airport provides flights to Karachi. ^ Airport information for OPDG at World Aero Data. Data current as of October 2006.Source: DAFIF. ^ Airport information for DEA at Great Circle Mapper. Source: DAFIF (effective October 2006). This page was last edited on 19 April 2019, at 05:09 (UTC).